You MUST have good upload speed to have the fastest download speeds. Why is this? Because the bittorrent protocol was designed to minimize “leechers”, or clients that download a lot, but don’t upload anything, or contribute in the most minimum. If no-one is sharing, who can receive anything at all?! So, in the protocol, which is the way the torrent network works, those clients that also upload as much as they are asked to, are “unchoked”, or permitted to download more pieces they need. Peers communicate to each other how others are contributing, so if no-one reports that you are uploading, you will not get any cooperation from any peer. But, If I just started, and I don’t have any pieces, and no-one is willing to give me anything, how on Earth will I be able to contribute and get the file? Well, to permit that, every client allocates a bit of bandwidth to new members, or to choked members, to permit them to get a good start. But be aware this is just a little part, if your client just depends on the “kindness” of the others, you will not be able to get the fastest. 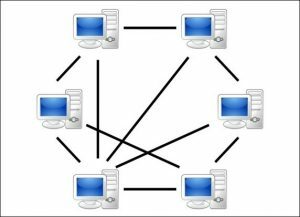 Now, most Internet links are full-duplex: that means that it is able to download and upload at the same time without interfering. So, no matter if you are downloading at max speed, you still have available upload bandwidth. So, if you use this spare bandwidth to allow your client to upload, you will see better and faster speeds on your downloads because the peers do notice, and they send more to you. This is of course all automatic, you normally are not in there programming the protocol into your software. But most clients have some settings that allow you to specify how much bandwidth you allow for downloading and uploading. Setting these wrong can mean you could be blocking yourself. Also, there’s the connectivity issue. Many users are not aware that they are crippled by an Internet link that does not allow incoming connections. This is critical for bittorrent because it means that other users may not be able to connect directly with you, so they cannot help you sending you pieces. They also may be behind a NAT link, which means they cannot receive connections either. If both cannot receive a connection, direct communication is impossible! How can you fix this? Normally, you would need to connect to your local Internet router, and “open” up a port, or “redirect” a port to your client computer. This is a bit difficult and out of scope of this article. An Internet search may help if you are in this case. Another way to fix this is to enable uPNP (which is mostly on by default), which is a protocol that opens ports automatically. You might want to check your software and your Internet router if there is a setting for it and having it turned on. The fastest way to download a torrent is by downloading it in a high-speed Internet server! TransferCloud.io can help you with it! Normally, an Internet server runs in the hundreds of dollars a month, and is way overkill just for downloading! But for just a fraction of that cost, TransferCloud.io can download it for you: we have optimized the bittorrent software to download the pieces in the fastest way possible, also uploading to others to achieve better speeds. Big files are downloading in seconds and you can transfer them to your personal drive space, be it Dropbox, Google Drive, Amazon Cloud and others! That way you can continue downloading without having to worry about it getting filled. Register now for a free trial to check it out!